Another week of experimentation and taking my training to new levels. This week I introduced doubles to my training. On Tuesday and Thursday I did my usual 60-65min ran at MAF in the morning and then went for a second, very easy, 30-ish minute run in the afternoon. I was expecting this to have a real noticeable impact on how I felt, but it didn't seem to make me feel any more tired than usual. Even after doing parkrun on Saturday, I woke up at 6am today for my long run and my HRV was up at 70, the region it sits when I'm really recovered. Maybe the fact I'm doing the runs at MAF is accounting for this. Ran parkrun on Saturday for the first time this year. Not a bad run but I could definitely feel the week's training in my legs. Reading parkrun was down at Dinton Pastures again which is a much tighter course with a lot of sharp corners and lapping of slower runners so this naturally slowed me down, but I didn't have it in my legs to pick things up much on the straights. Of course this could also be due to not really doing much in the way of intensity recently. As you can see, I took the wrong fork in the road and headed out into the countryside. 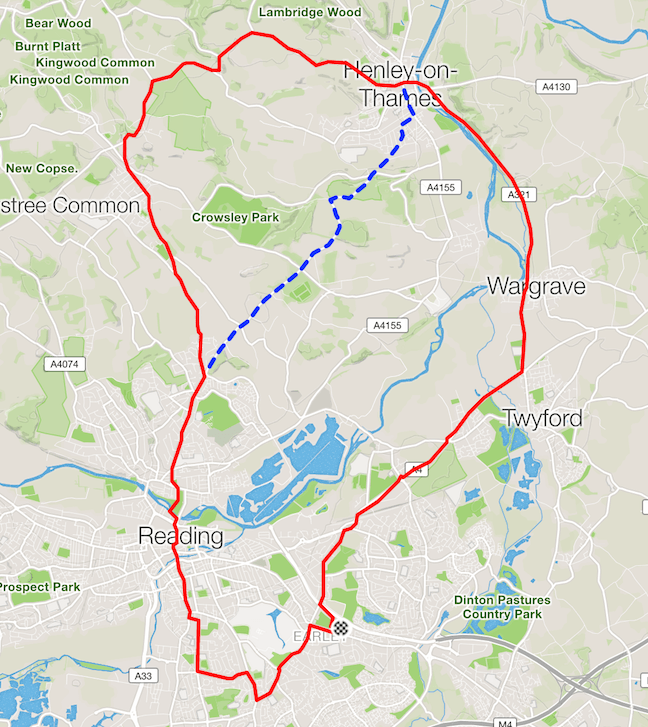 Had I taken the original planned route along the dotted line, today's run would have taken about 2:45. Instead it ended up being 3:02 and that's with a push over the last fifteen minutes to see if I could get in under three hours. Thankfully the detour didn't take me too far off course. As with all my running, I kept my HR within MAF range for the most of the run with the exception of some of the sections along country roads with no pavements - these always get my heart rate going as it could mean a last moment dive into the hedge to save my life from a speeding motorist that hasn't seen me - and the last fifteen minutes. Felt surprisingly good on the entire run given yesterday's parkrun and the high mileage for the week. Also did the entire long run on a cup of tea and a tablespoon of MCT oil. Next week will see a backoff in mileage, though I will be keeping the doubles. I'm also planning on introducing a second high intensity run in each week starting the week after next. The idea hear is to explore polarised training and see how much of an impact it has on my training. I plan to write a separate post on what I've read on polarised training and some of the research behind it. Well, that's it for this week. Time for a short 🚶 for a few 🍻.